Now is the perfect time to plan a trip to beautiful Lanesboro, Minnesota. Be sure to include a tour with us at Bluffscape Amish Tours. Your tour will depart from Stone Mill Hotel & Suites in Lanesboro to travel the rolling Amish countryside. The Amish are busy working the soil in preparation of their spring planting. It is always a treat to see the horses pulling a one-bottom plow. A gentleman on my tour yesterday said it reminded him of his youth as he had to do similar work in their fields years ago. At the Amish farms we will get the chance to peruse the Amish shops for handmade reed baskets, leather belts, locally made scatter rugs, hand stitched quilts, and much more. My favorite treat is Emma’s dark chocolate covered cashew crunch–sweet and buttery! Your guide explains all about the Amish culture and will answer any questions you may have during the tour. 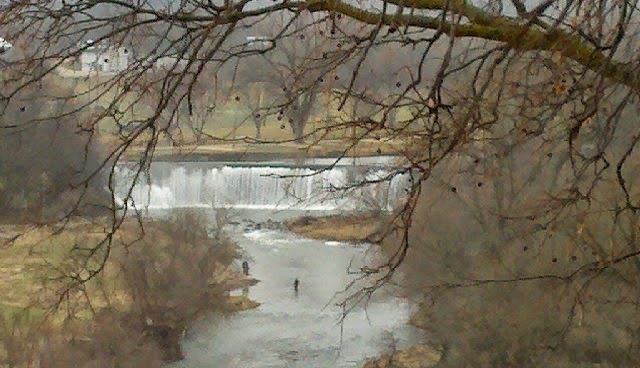 As you can see by the above photo, trout fishing by the Lanesboro dam is a favorite for many folks. This is a view of the Root River from Bethlehem Lutheran Church in Lanesboro. If the people you are traveling with like to fish and some would rather find something else to do, an Amish tour would be a great way to spend your morning or afternoon! Tour guests enjoy the Amish shops on our tours. Beautiful hand-made aprons, quilts, potholders, and baskets can be found on Amish farm shops. One day I had a tour guest purchase four Amish quilts for Christmas gifts for her children and one for herself. Not only was the guest excited with her special purchase, but the Amish ladies were very grateful for the sale, as the economy has slowed down their sales this past year as well. The recipients of those quilts are very lucky, as the quilts are pieced with a treadle sewing machine and all hand stitched with care.